The prime suspect for ordering Yerokin's kidnapping and killing is 'a serious businessman from the Donetsk oblast', who is also a parliamentary deputy. Yerokhin had been investigating money laundering operations in the Donbas, and had received death threats. Several suspects who allegedly physically committed the crime, are already in custody. I have blogged recently about this important case in several postings. Hundred of Yerokhin's colleagues attended his funeral together with about 3,000 residents of his home town, Makiyivka, where he had also been a town councillor for Nataliya Vitrenko's radical Progressive Socialist party. Minister of Internal Affairs Yuriy Lutsenko, one of the Orange Revolution's field-commanders, also attended the funeral. Those present expected Lutsenko to name the prime suspect, but they were dissappointed. At the wake, Yerokhin's fellow policemen bitterly expressed the view that they were "all hostages in a bigger political game in which the slogan 'Bandits to jail!' sounded like scorn directed at those of their number who believed in the ability of the new [orange] authorities to ensure that the law remains supreme." Yerokhin's colleagues have no confidence either that the Prosecutor General, Oleksandr Medvedko, who has taken over investigations from the Ministry of Internal Affairs, will solve the case. Medvedko, a Yushchenko appointee, has dubious track record as a former Donetsk prosecutor, which only confirms their fears. 'It's quite possible that that he was a Trojan horse within Lutsenko's inner circle,' he added. When the Verkhovna Rada reconvenes next Tuesday one of its new deputies may have ordered this kidnapping and assassination of a senior anti-corruption police officer. Corruption is problem #1 forUkraine's authorities to tackle. Why should the police continue investigating cases such as those being persued by Yerokhin without the support of higher authority? PoR should 'give up' this deputy, but they won't because many of their number have committed serious crimes in the past too, and are part of the problem. They know that if they 'stick together' they will be all right. Two big petroleum refineries in Ukraine are now undergoing 'kapitalnyi remont' [remont, ie 'maintenance or repair' in Ukraine is often a catch-all excuse covering a multitude of deficiencies and sins]. A piece in Ukrainian Journal explains why there may be more to this than meets the eye. A quote: "The government fears the [temporary] closures of the oil refineries may trigger a wave of gasoline price hikes next month despite the government’s efforts to encourage oil firms to boost gasoline production in Ukraine. Analysts said that high oil prices on world market encourages Russian oil companies to export crude rather that to ship it to their refineries in Ukraine. Most of the Ukrainian refineries produce low-grade gasoline or, like Lukoil-Odessa, fuel oil, which is later exported overseas." On Monday,when writing about these matters I said, "If [the oil companies] can get away with selling 'crap' to the market, why change?" Clearly they are in no rush to improve their products, so foreign companies should be allowed into the market to satisfy needs, rather than their products being subjected to hefty 25% duty. The Yanuk gov. know a drop in supplies could very quickly trigger a big crisis. There were rumors that a recent visit by Yanuk to Moscow 'for treatment to an old sports injury,' was a just a cover for secret talks exactly on these matters. The new Cabinet of Ministers are already beginning to 'tread on the toes' of President Yushchenko, changing the VR 'rehlament' in order to restrict the President's power to cancel Cabinet of Ministers' acts. Yanuk is still on holiday, so first deputy PM Azarov chaired a cabinet meeting where these matters were decided. Developing a plan to elevate the Russian language to that of a second state language, in contravention of the spirit of the recently-signed 'Universal' was also discussed. The new government will surely keep chipping away the President's powers and authority. It's time to stand up to these guys Vitya.. 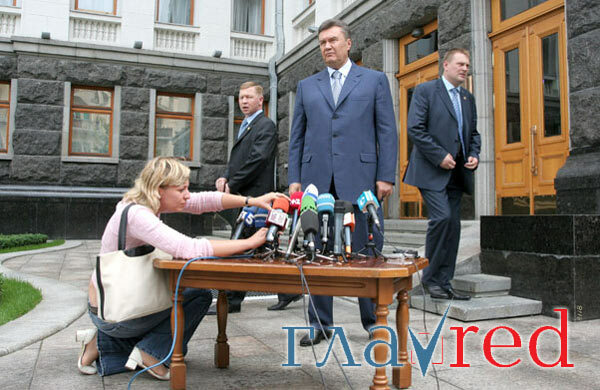 Almost a month has passed since Yushchenko proposed Yanukovych for PM, and his candidature was ratified by the VR. New Ministers, deputy ministers, and heads of state enterprises have all been appointed. To an almost astonishing degree most of the 'new boys' are closely linked to PoR VR deputy Rinat Akhmetov's 'System Capital Management' business empire. The new PM, and 3 of 4 deputy PM's hail from the Donetsk oblast, as do over 70% of ministers and their deputies. The energy and power complex is totally dominated by Akhmetov's people. Apart from ministers in charge of the fuel-and-energy-complex - Andriy Klyuyev, Yuriy Boyko, Vadym Chuprun and Oleksiy Scheberstov, 'Naftogaz Ukrainy' is headed by Volodymyr Sheludchenko [formerly of Donetskoblgaz], and state company 'Gaz Ukrainy' is now run by Sergiy Zubov [from Kramatorsk]. Electricity generators are also almost exclusively now run by guys from the same stable. E.g. state company 'Energy company of Ukraine' is run by Ihor Hlushchenko -[a director of 'Skhid-Energo - part of SCM], and the new head of the State electric power regulatory body is Oleksandr Rogozin, an old chum of Andriy Klyuyev. A quote: "All key positions in the field of gas and energy are now occupied by graduates from the SCM empire, or from the top management of structures controlled by this financial-industrial group." In charge of Ukraine's state finances is Mykola Azarov, who has appointed his old cronies Anatoliy Brezvin to run the State Tax Administration, and Serhiy Kharchenko to run the State Treasury. Azarov systematically abused his position when he was in charge of the STA under Kuchma, as heard on the Melnychenko tapes. He allegedly also ran a tidy VAT fraud scheme depriving the state of huge sums of money. The important state rail transportation system in now run by Volodymyr Kozak, from Lemtrans, part of SCM. Former president Kuchma ensured that Yanukovych's placement of his own people to influential positions, when he was previously PM, was limited. President Yushchenko has failed to do this. Even former PM's and NSNU leaders Kinakh and Yekhanurov, who favoured formation of a grand coalition with PoR, are worried. Sure, Ukraine's economy is growing nicely and impressive GDP figures are being prognosed, but with these guys in charge, will the man in the street feel this in his pocket? Or will Rinat Akmetov's wealth, which according to some, stands at $7Bn, get closer to Roman Abramovich's $17Bn in the next couple of years? The several hundred million that allegedly were paid in bribes to the Socialists and Communists, and possibly others, could turn out to be money really well spent. Several years ago in Great Britain, hauliers, farmers and truck drivers picketed British refineries to protest against increases in fuel tax. The knock-on effects were startling and almost immediate. Huge queues developed at gas stations as panic buying spread, prices rose dramatically, and garages quickly ran out of stocks. Within very few days the government 'caved in' because the country was grinding to a halt. Reliable delivery of gasoline to consumers, is a very very sensitive subject. The Ukrainian Cabinet has now signed a memorandum of partnership with the refinery owners, many of whom are Russian. Imports, particularly of higher grades of fuel will be shut out, and Ukrainian refinery owners will get tax privileges and other perks, ostensibly to enable them to upgrade their plants. Rail transport tariffs will also be reduced. In exchange for this, the refinery owners have promised they will not act as a cartel and rig the market, and will produce more ecologically clean fuel. Ukrainian authorities hope prices will now stabilize, but no price parameters have been indicated in the memorandum. Things look different at ground level, however. Recent checks by regional authorities in Ukraine reveal that over 71% of Ukrainian garages are selling sub-standard fuel. It is something that Ukrainian drivers have to continuously put up with. The State consumer standards watchdog, having tested 20 million litres of fuel at retail outlets totally removed 2.65 million litres from sale. The main reasons given were octane ratings lower than those specified, and the inclusion of benzol - not good for modern engines. Many gas stations were also selling short measures, and could not produce quality certificates. These are matters the government should be addressing first, but as usual the consumer gets 'the dirty end of the stick'. If you can get away with selling 'crap' to the market, why change? Still the same faces on the Ukrainian political roundabout - Independence day photo [featuring Moroz, El Kuchmo, Yu and Ya] Depressing.. Are these the men that are really going to make Ukraine better? ps Can't think of any other president who 'displays' his children as much as Yush..
Maybe sees himself as another Jack Kennedy? According to the Novosti-Donetsk website Vadym Klikovskyi, one of the prime suspects in the murder of senior UBOZ investigator Roman Yerokhin, was arrested in Ternopil last night. I've written about this case in my last two blogs because it illustrates yet again how crime, politics, and law-enforcement agencies are grotesquely intertwined in Ukraine. As the arrest was taking place, Klikovskyi attempted to shoot himself with rubber bullets [? ], but was prevented from doing so. Klikovskyi was a Donetsk policeman who worked for the ex-chief of the Donetsk police Anatoliy Voloshchuk. On the eve of the 2004 Presidential elections Voloshchuk had been transferred to the Kyiv oblast Minister of the Interior main directorate, and Klikovskyi later also moved and headed the Irpin Min of the Interior regional directorate [near Kyiv]. Irpin had been a PoR stronghold during the recent VR elections. The Novosti piece includes this intriguing passage: "It is commonly known that one of the minister of internal affairs' deputies took direct part in the pressure applied to Yerokhin. 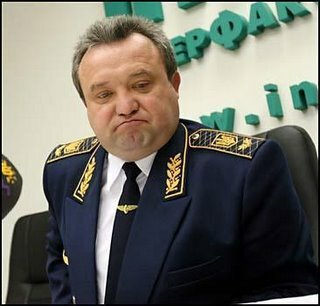 Obviously the highly-placed general will be able to explain to the prosecutors' investigators the reasons that urged deputy-minster to "dismiss" Yerokhin, and [give them] the names of the people who "asked" him to do it. Will Klikovskyi 'click' with the investigators and 'give up' the zakazchik? ..общеизвестно, что непосредственное участие в давлении на Ерохина принимал один из заместителей министра внутренних дел. Очевидно, высокопоставленный генерал сможет объяснить следователям прокуратуры причины, подтолкнувшие замминистра «увольнять» Ерохина и имена людей, «просивших» его об этом. KIEV, Aug. 21 - Russian and Ukrainian oil companies will seek to boost supplies of crude to Ukraine in order to increase production and exports of gasoline, according to an agreement signed with the government Monday. The government pledged to provide tax breaks for modernization of oil refineries and will probably increase duties on imports of gasoline to make oil refining in Ukraine more profitable, according to the agreement. Top managers of major Russian oil companies such as Lukoil, TNK-BP, Alliance Oil and Tatneft, and also Ukrainian oil companies such as UkrNafta and UkrTatNafta, met Prime Minister Viktor Yanukovych on Monday. This was the second meeting between the government and major oil companies over the past seven days as the government seeks to prevent a rapid increase in gasoline prices. “We stress that we favor market relations in order to create rules of the game… for the sake of the price stability,” Yanukovych said after signing the agreement. Gasoline prices in Ukraine stabilized at 4.7 hryvnias ($0.93) per one liter of 95-octane gasoline over the past seven days, ending three weeks of rapid growth, during which in some regions the price had reached UAH5.2 per liter. At the meeting a week ago, the oil companies apparently agreed to keep the prices at UAH4.7 per liter after the government had threatened to use regulations that could hurt them. Ukraine has six oil refineries, most of them owned and managed by Russian oil companies such as Lukoil, TNK-BP, Tatneft and Alliance Oil, but the refineries have been staying idle for most the past year. Lukoil closed its Lukoil-Odessa refinery in July 2005 for a three-year modernization, while Alliance shut Kherson NaftoPererobka in August 2005 indefinitely, citing the need to upgrade. Analysts said the closures were forced by an influx of cheap gasoline from Eastern European oil refineries such as Mazeikiu Nafta of Lithuania and Mozyr of Belarus. The influx increased after the government of then-Prime Minister Yulia Tymoshenko pushed through a resolution that lifted duties on imports of gasoline and diesel fuel in May 2005. The move was aimed at ending rampant increases in gasoline prices at the time, but oil companies, unable to compete with modern oil refineries in Eastern Europe, reduced supplies of crude to Ukraine in response. Oil supplies to Ukraine dropped 29.9% on the year to 6.29 million metric tons in January-July, down from 9.4 million metric tons a year ago, according to the Energy and Fuel Ministry. Oil companies have been persistently asking the authorities to re-introduce the duties on imports of gasoline and diesel fuel. Energy and Fuel Minister Yuriy Boyko said Monday the government may actually re-introduce the duties later this year. “The best time to cancel the zero duties is the end of fall, when demand for gasoline is declining,” Boyko said. Before introducing zero duties on gasoline and diesel fuel imports, Ukraine used to charge duties between €15 and €40 per metric ton. The Economy Ministry recently suggested setting the duties at between €20 and €25 to encourage domestic oil refineries and to prevent an increase in gasoline prices." I'm not an authority on these matters, but it seems to me that shutting the door onto imports of fuel may cause problems, because Ukrainian's aging refineries have difficulty at the moment satisfying domestic demand for higher quality grades of gasoline. Shutting out these imports will not encourage Ukrainian oil processors to improve the quality of their products, and they will rig the market between themselves, as before. A bit more on the story I wrote about yesterday. The 'zakazchyk' who ordered the kidnapping and murder of Roman Yerokhin, a colonel in the Adminstration for Tackling Organized Crime [UBOZ], is a Donetsk businessman and a parliamentary deputy, according to minister of internal affairs, Yuriy Lutsenko. A key witness, former UBOZ employee Vadym Klikovskyi, is being hunted. His evidence can 'finger' the zakazchyk, but he has twice been tipped off and has, so far, evaded capture. Lutsenko says the gang that kidnapped and murdered Yerokhin includes former employees of the state tax police, former employees of the ministry of the interior, and criminal elements. A lot more on this case [in Ukrainian ] here. Tomorrow Lutsenko will attend Yerokhin's funeral in Donetsk. This story could 'have legs' and potentially be 'very big', but the involvement of the Prosecutor-General diminishes the chances of charged ever being brought against the perpetrators - absolutely disgraceful.. The handcuffed body of a senior officer from the main directorate of the Adminstration for fighting organized crime [UBOZ] Roman Yerokhin, was found buried today near Kyiv. He had been shot 7 times in what cleary was a 'contract hit'. He had disappeared on 27th July. Previously, on 11th August Minister of the Interior Yuriy Lutsenko announced in a press conference that Yerokhin had been kidnapped. He had been investigating a large conversion and money laundering operation linked to a 'Donetsk financial establishment'. Yerokhin had been a former deputy head of the Donetsk UBOZ, but was transferred to the main directorate in Kyiv in February 2006, after he had received threats connected with his investigative work in the Donbas region. Yuriy Lutsenko astonishingly claimed that parliamentary deputies 'from both sides' may be involved in the crime. During the Orange Revolution, Yekokhin frequently visited Kyiv together with many of his men, to execute special operations for the 'blue team'. Yerokhin was responsible for paying out cash to the blue 'revolutionaries' eg miners, who were being transported to Kyiv. Lutsenko added that they suspect who the 'zakazchyk' that may have ordered the 'hit' is. He is a representative of the Donetsk financial establishment, who could well have relationships with the Ukrainian parliament. "If we can determine who ordered the 'hit' then this may have seismic consequences, and may be a very serious blow to the methods of forming party lists, to which politicians, both opposition and in power, stoop." Three suspects were arrested on August 8 and are in custody. Adding to the mystery is a statement made today by Progressive Socialist Nataliya Vitrenko, leader of the extremist People's Opposition Bloc. Yerokhin [oddly?] had been a Makiyivka [Donbas] city council deputy from her party. She accuses Lutsenko of being responsible for Yekokhin's death, because he publicly revealed that Yerokhin had dissappeared, forcing his kidnappers to murder him. The track record of solution of previous similar cases indicates that the chances of this crime being solved are almost nil. The Prosecutor-General Oleksandr Medved'ko is making his own investigations into the matter, but his track record over many years in the Donbas region's prosecutor's offices may be described as being distinctly 'patchy'. This little piggy went to market, this little piggy stayed home..
Tammy Lynch makes a pertinent observation in her piece 'Changing of the Guard'. "Yanukovych’s trip to Sochi suggests that the way foreign policy has been handled in Ukraine by President Viktor Yushchenko may be changing. The fact that Yanukovych was granted permission by Yushchenko (who has responsibility for the country’s foreign policy) to take this trip, may signify a shift in the president’s handling of international questions." The last link quotes an 'expert' who says: "Yanukovych couldn't promise Russia anything because he is aware that in three or four weeks he needs to fly to Washington - he is trying to be sufficiently flexible so as not to place himself into an awkward position in Washington." Wonder who will go with him..
and this little piggy - went "wee! wee! wee!" all the way home. I have already blogged several times about how quickly 'Donetski' are moving 'their men' into positions of power following their recent political successes, despite Yanukovych declaring at his first press conference as PM. "Professionalism does not have a color..". Ukraine is a large country with few motorways, but with a large heavy industry sector, so the state railway administration, 'Ukrzaliznytsya', [UZ], plays a vital role in the Ukrainian economy. The Donetski have wasted no time and last week tried to replace the current head of Ukrzaliznytsya, Vasyl Gladkikh with one of their own, PoR deputy Volodymyr Kozak. Because Gladkikh is on holiday, according to Ukrainian employment law, he cannot be legally kicked out, so Kozak has been appointed 'zamgendyrektor', but there is little doubt he will get the top job soon. Kozak was the general director of a large Donetsk corporation - 'Interregional Industrial Union', one of the business structures of Rinat Akhmetov, which also includes freight expeditor 'Lemtrans'. An article in the latest 'Bez tsenzury' periodical describes the shenanigans and the 'cold war' that have gone on between UZ - which they call it 'a state within a state', and their big industrial customers. It provides an example of the turf wars and asset grabs that have characterized Ukraine's recent industrial past. In early 2003, the head of UZ, Heorhiy Kirpa, [committed 'suicide' in late December 2004, remember?] opposed by the then PM Yanukovych, but supported by pres Kuchma, significantly increased tariffs for transportation of freight. In response, the metallurgists of Donbas and elsewhere, increased the price of products, in particular rail-track, railcar wheel tires, points etc. sold to UZ. The min of Transport's riposte was to purchase these and other essential products abroad. The 'metallurgists' then sought an alternative to UZ - Lemtrans. In 2004-2005 this company was at the center of a big scandal which involved the unsanctioned transfer from UZ to Lemtrans of nearly 4,000 special purpose railcars including those for transporation of metal ores. In the middle of 2004, when Yanukovych was still PM, the min of Transport and UZ signed an agreement to transfer 13,600 railcars to two private companies - Lemtrans and Ukrtransleasing. At the same time the cabinet of Ministers agreed to reduce transportation tariffs for heavy cargoes to operators using their own, or leased rolling stock. The net result of all this was a loss to UZ of about $50m. plus the loss of railcars worth about $100m. About a year ago a court adjudication supposedly settled the entire matter, and an agreement was signed between the Donetsk city council, Akmetov's SCM, and Lemtrans. The railcars were to be returned, but to this day are apparently still in the hands of Lemtrans. Meanwhile minister of Internal Affairs, Yuriy Lutsenko, is investigating fraud amongst the top echelons of UZ involving suspicious tenders, and charitable donations. Lutsenko has complained that Gladkikh threatened a rail strike if he did not 'back off ' with his investigations, but added that Yanukovych has given him the 'green light' to continue.. Discussion on Recent Developments in Ukraine..
Last week a presentation: "Interpreting Ukraine: A Discussion of Recent Developments; [Ukraine after the March Parliamentary Elections: A New Trajectory for the Orange Revolution?]" was held at the Center for Strategic & International Studies, Washington DC. Taras Kuzio, Anders Aslund, and Steven Pifer all spoke, speculated, and answered questions from the floor. A transcript, and an audio recording of the proceedings can be read and heard here. If you have an hour or two spare, might be worth giving it a listen.. In my opinion, not enough was made of where much power now really resides in Ukraine - in the Financial-Industrial Groups of the east. The respectable 'Korespondent' periodical has just published a list of 100 most influential people in Ukraine. Top of the 'muck-heap' - Rinat Akhmetov. The new Yanukovych government has pegged the price of gasoline and diesel fuel at gas stations, after talks with refinery owners and gas station owners several days ago. If the latter overstep agreed maximum prices, the government has said that deliveries to them will be terminated. There are already reports of rationing in some areas, at a time of year when fuel demand is high because of agricultural requirements and the holiday season. Some of the gas stations in the east of Ukraine are run by PoR 'big rollers', including Yanuk's son, so they won't be pleased. Many of Ukraine's refineries are wholly or partially owned by Russian and other foreign concerns, they won't be happy either. Maybe Azarov's tax police will be used as in the days of Kuchma to 'assist' in compliance. Ultimately, you can't buck the markets. Who will be blamed when the gas stations close? Will Yushchenko intervene as he did in similar circumstances when Yuliya T was PM? Thursday Update: Predictably, queues are already being seen at gas stations - a gas crisis may develop very quickly now.. Yesterday I wrote about a special edition of Akhmetov's 'Segodnya' newspaper which supposedly included an article alleging Yuschchenko and his family had received huge sums of money from gas-trade intermediary companies. Apparently the special edition was 'pulled' and recalled from newspaper stands once Yushchenko had agreed to nominate Yanukovych for PM. Thousands of copies must have been printed. Have any come to light? Or was it a bluff? Or maybe the entire story is fiction. As often happens in Ukraine, sensational accusations are glibly thrown around, but corroborating evidence is seldom produced. Eg Yuliya T made accusations in a radio interview that BYuT deputies Turchynov and Kozhemyakin are to be prosecuted...no evidence produced..and now the Prosecutor's office have denied it too. ByuT deputy Oleh Lyaskho claimed to be in possession of tape intercepts where bribes to Moroz are discussed...and so on. Even though there is good reason to believe the accusations have firm grounding, solid evidence is seldom produced. Is it because the Prosecutors are so corrupt that even if they are provided with 'rock solid' evidence nobody is ever charged? Maybe that's the reason PoR have no problem with Lutsenko remaining Minister of Int Affairs. And you can walk right out again as soon as you are in..
On the night of 2nd August, when it was not clear, what decision would be made by the head of the state, in one of the Kiev printing houses a special night release of the newspaper "Segodnya", owned by Rinat Ahmetov, was printed. The main article of the edition was to be entitled «Yushchenko to be accused of larceny of $1,2 billion ». According to the newspaper, in case of dissolution of parliament, deputies from socialist and communist fractions were ready to initiate impeachment of the president, the case being based on material from the USA Deptartment of Justice which link Yushchenko with RosUkrEnergo. It is alleged that immediately after the conclusion of the Russian-Ukrainian gas agreements in January of this year, the accounts of members of family of the Ukrainian president were credited with 1.2$Bn from Switzerland. The compromising evidence was passed to Moroz and Tymoshenko by employees US State Department at the end of June, when « Our Ukraine » shifted from the "orange", to the "grand" coalition, which includes PoR. The Donetsk newspaper accused Tymoshenko of blackmailing Yushchenko with this material, demanding that he dismiss parliament. When Yanukovych was nominated prime-minister, absolutely symmetric accusations were being made from the BYuT camp. Apparently video tapes of a recording of the President to the nation, in which he dismisses parliament, had already sent to TV stations. But then Yanukovych turned up at Yushchenko's office bearing with him the above-mentioned special edition of "Segodnya", and forced Yushchenko to change his decision. The following Saturday Yuliya T made loud accusations of blackmail in an interview on radio "Svoboda", then disappeared from the country. Officially her colleagues who have all departed to holiday resorts, say they do not know, where their leader is. Insider sources inform, that Yuliya spent two days in Moscow. In comments of mass-media sympathetic to Тymoshenkо, political scientists say that this is just an attempt to blacken her name, but informally the same people accept that Yulia T visited Moscow not only in August, but also in June - twice. The period of these "visits" coincides with the the revelation of the compromising material on Yushchenko. Meanwhile on the following Monday the newspaper "Segodnya" publicly apologized to president Yushchenko for the night special release. The special edition dissapeared from their website, as well as from news-stands. On Monday a telephone conversation between Vladimir Putin and Victor Yushchenko took place. The "pro-Russian" prime-minister Yanukovich in the meantime met the American ambassador in Ukraine William Taylor who handed him Georges Bush's official congratulation. Details of their conversation are not disclosed, but it is known they talked about deliveries of gas to the Europe. It is known, that the USA insist on the elimination of the RosUkrEnergo scheme and are lobbying their own interests in this business. And only then, late at night did Putin congratulate Yanukovych — once, instead of three times, as during presidential elections when the Donetsk protege lost. Next week the new head of the cabinet of ministers will arrive to Moscow — quite officially. And discussions will again be about gas. The first thing that Donetski will try to do, having come to power, is to stabilize work of «Naftohaz» which, by the efforts of their orange predecessors has been driven to a condition of bankruptcy, and which is being systematically squeezed out of the domestic market by companies under control to "Gazprom". However Ukrainian business has no intention of giving up this field to the Russians. It is obvious, that Moscow will try to weaken somehow the determination of the new Kiev interlocutors. Probably, having obtained support of new oppositionists. PoR mouthpiece Taras Chornovil claimed in a recent newspaper interview that saw Yuliya T snorting cocaine, and suggests that she asked her bodyguards to obtain coke on her behalf. This is not the first time that Chornovil has made similar assertions in what seems to be a concerted campaign to blacken the only politician in Ukraine that PoR and other parties truly fear..
BYuT's riposte includes this: "Chornovil's wish to pour dirt onto the leaders of the opposition is evoked by the intention to drag all politicians to the level of his party's bosses, in as much it is difficult for Party of Regions to realize that in Ukrainian politics there are people who do not steal enterprises, do not mislead the electorate, do not use narcotics, and never tore off fur hats from passers-by." Chornovil is #3 on a list of political turncoats and traitors of which the recent history of Ukrainian politics is replete. Quote: "#3. Taras Chornovil - son of an outstanding activist of Ukraine’s national and democratic movement Vyacheslav Chornovil, enjoyed a great support of his late father’s voters. He was a member of Viktor Yushchenko’s Our Ukraine faction. But in April 2004 he left it for the Party of the Regions faction. In 2004 presidential elections he backed Yushchenko’s rival Viktor Yanukovych. Taras Chornovil’s name is frequently used as a synonym for treason." The list is headed by former long-time Socialist leader, and new VR speaker Oleksandr Moroz. Others on the list include Tymoshenko, Azarov, and Zinchenko. Today's 'Ukraina Moloda', which is edited by a trusted old chum of Yushchenko's, runs a story underlining how quickly Yanukovych's new ministers are introducing 'svoyi poryadky'. A gentleman's agreement between Yu and Ya had been struck that the head of the State Tax Administration [DPA] would be amongst the president's quota of selections of high ranking state officials. But as soon as Yushchenko had departed for a break in Crimea, new deputy PM and a former head of the DPA Mykola Azarov forced the incumbent head, Oleksandr Kiryeyev, to resign, and immediately appointed Anatoliy Brezvin, with whom Azarov had worked during the times of Yanukovych-1 and Kuchma, to the position. Kiryeyev is an old Yushchenko colleague from Agrobank "Ukraina" and National Bank of Ukraine days. 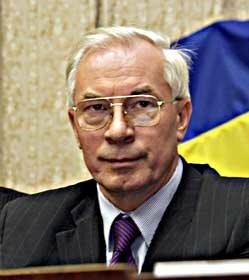 Azarov's period as head of the DPA between 1996 to 2002 was characterized by systematic abuse of power, as revealed on the Melnychenko tapes. Kiryeyev was given a farewell gift of flowers and a Parker pen, according to the DPA press service. PoR, I imagine, would like to attract as many NSNU deputies as possible into their coalition of national unity when the VR reopens for business. 30 NSNU deputies voted for Yanukovych out of 269 votes cast in a 450 seat parliament, in order for him to become PM. Stunts such as this will not help them make friends in Kyiv, so weakens their coalition. Journalists and others working in the mass media have today issued a declaration condemning specific events that took place over the last few days, which, they say, may indicate a return to the bad old times of censorship and pressure. The incidents include kidnapping, physical assaults on journalists, and a refusal to allow channel 5 the right to broadcast 'live', a government press conference. They appeal to the minister of internal affairs, to Yanukovych's press secretary, and others to sort these matters out. In the event of continuing pressure, they threaten to use various forms of active protest. PM Yanukovych today signed a Cabinet of Ministers decree to enable civil servants to be sacked without warning. The Cabinet of Ministers also sacked the head of Ukrainian railways, Vasyl Gladkikh on Friday. The head of 'Lemtrans', one of the companies in Akhmetov's SCM industrial giant, has been approved as deputy head of the rail service. 'Donetsky' are also moving in on the State tax administration, Azarov's old 'stamping ground'. PoR have a opportunity now to show that they have 'changed their ways', and to increase their support base, particularly in central regions of Ukraine. Will they be smart and try to live up to their new 'clean' image, or will they again reveal themselves to be 'bandits'? New minister of fuel and energy, Yuriy Boyko yesterday renewed his Russian contacts at Gazprom when he met its CEO, Aleksey Miller. It was Miller, who together with Boyko signed the agreement by means of which RosUkrEnergo became the transit operator for Turkmen gas supplied to Ukrainian markets. RUE is now the monopolistic supplier of gas to Ukraine. An article in 'Vremya Novostey' declares:"The key question for Kyiv in future negotiations is the position of Moscow with respect Turkmen gas, which forms more than 50% of Ukraine's gas balance. It is well known that the contract between Gazprom and Ashkabad for the purchase of 30Bn cu.m. of gas at $65, (which is transferred to RUE and delivered at the Russian-Ukrainian border for $95), terminates in October. The president of Turkmenistan proposed extending the contract, but with new conditions - that the price for gas is increased to $100 per Th.cu.m., but was told to 'get stuffed'. However, without 11 -12 Bn cu.m. of Turkmen gas in the final quarter, Ukraine will either freeze, or will be forced to renew its habit of skimming off of unsanctioned gas intended for customers in other parts of Europe. So it is vital for Boyko to know if Gazprom is ready to act in concert with Kyiv in price negotiations with Turkmenbashi. The price finally agreed for Turkmen gas will determine whether or not the $95 price that Ukraine pays at the moment can be maintained until the end of the year (this was one of Yanukovych's promises made during the VR election campaign)." 'Vremya Novostey' suggest that negotiations will not be drawn out for long because the Russian PM has to fix the budget for 2007 next Thursday. If Yanuk and the new cabinet can close a good deal, plenty of kudos will be accrued. Complications in the Russia-EU energy relationship are well described in this recent Oxford Institute for Energy Studies paper. A quote: "..the projected decline of Russian gas output from existing fields [is] from 545.1 Bcm in 2004 to 344 Bcm in 2020...Gazprom alone requires about $100Bn to develop new gas fields. The existing energy infrastructure..also requires considerable investment for modernization and maintenance." If there is a severe winter in Europe, my guess is that gas pressure drops will be again be experienced, but EU leaders don't seem to be too bothered at the moment..
ps Hello to the boys and girls at 'KP'. UNIAN reports the newly-apppointed PM Yanukovych is reintroducing the practice of halting traffic through the center of Kyiv to enable his cavalcade to pass unhindered between government buildings . 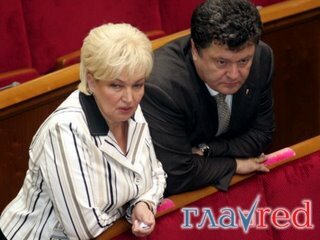 This practice, which was abandoned by Tymoshenko and Yekhanurov when they were PMs, will in no way endear him to Kyivites. UNIAN, which is normally quite a staid news agency website, has posted potted biogs of the 'new-boys' in the Cabinet, highlighting their disreputable backgrounds. I have already blogged briefly about vice-PM and minister of finances Azarov, vice PM Klyuyev, and fuel and energy minister Boiko. #4 on the Unian list is Vasyl Dzarty, the new minister for protection of the environment and ecology [see photo.] The invariably snappily dressed Dzarty who reminds me of an extra from Paul Newman's and Robert Redford's 'The Sting', is an Akhmetov protege - he was 'pencilled in' for head of Donetsk oblast administration by Akhmetov, but the job went to Anatoliy Blyznyuk who was close to the then-PM, Yanukovych. Dzharty became Blyznyuk's deputy. Dzharty has reputedly served 'time' in the past, either for fraud, or stealing fur hats - something that Yanukovych was also allegedly 'send down' for in his youth. Details are uncertain because the court where criminal records were stored, was conveniently burned down several years ago. Other sources say Dzharty was in charge of a gang that 'sorted out' political opponents. In October 2003 he was probably involved in the wrecking of an 'Our Ukraine' congress in Donetsk, when its leader Viktor Yushchenko was run out of town. Last summer three criminal cases were opened against him involving misuse of budget funds. He would have been 'invited' to help police with their investigations, but he fled abroad. He himself claims to have been 'a flower trader, worked as a taxi-driver, and grew watermelons which he sold in street markets'. Maybe that's why he was appointed minister for the environment. 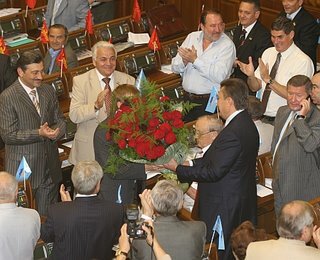 Ukr Pravda photo of PoR 'top bananas' including Dzharty, presenting flowers in the VR to newly-appointed PM Yanukovych. Sheludchenko, a Dontesk 'old boy', was deputy head of administration of the company until April last year. He is being lobbied by new deputy PM overseeing the fuel and energy sector, one of PoR's top men, Andriy Klyuyev. I wrote about the state of 'Naftohaz Ukrainy' - "a financial black hole run more for the interests of the elite that the state and its customers," several days ago. Other candidates for the position are said to include Vadim Kopilov who was head of the company between 2000 and 2002 [excellent credentials, then, ho-ho]; Anatoliy Rudnik who was general director of Ukrtranshaz; and Ihor Voronin who is presently deputy head of the State company and head of UkrHazEnerho. The name of Oleksandr Tretyakov, a close aide of the President, and linked to 'fiddles' in RosUkrEnerho, has been mentioned as a possible candidate also. Ukraine's new Fuel and Energy Minister Yuriy Boiko is the man who set up many of the shady schemes, by means of which Ukraine obtains its gas from Turkemistan and Russia. Some of these schemes are now exploited by Yushchenko and his 'dear friends'. Its quite possible that Boiko, who is not from the Donetsk clan, was appointed Minister of Fuel and Energy on the proviso that a 'Donetskiy' be in charge of Naftohaz Ukrainy, in order to keep an eye on the money flow in the State monopoly. What Boiko does have is unrivalled informal relations with Turmenbashi, the Russians, Firtash, and other main players - very important in this business. A highly placed source in the Cabinet of Ministers hinted that the 'Donteski' could even, in the near future, put the squeeze on the infamous intermediary company 'RosUkrEnerho', something that even Dmitro Firtash would not be able to withstand without the Kremlin's support. A commentator in yesterday's 'Ukr Pravda' argues that gaining control over the fuel and energy sector is vital for the Donetsk financial-industrial groupings [FIGs] - the PoR's paymasters, but this could lead to some friction with power utility companies controlled by other FIGs. The fuel and energy policies of the new government, whilst primarily protecting the interests of big business in the east of the country, could however, wind up being beneficial to the ordinary citizen, he concludes. In a radio interview yesterday Yuliya Tymoshenko bitterly ended her dialogue by reminding listeners of a promise made by Yushchenko during the Orange revolution: "I confirm bandits will not rule on our land," he said. "I can firmly say, that any person would be shocked at the coming to power in the cabinet of ministers in the financial sector, of a person who headed an operation to launder all value-added tax, on fictitious, non existent exports. Only in 2004, when I was PM, we presented documents to the Prosecutor, [on frauds involving sums] of almost 5 Bn hryven, [about $1Bn]. This person is now in charge of the entire financial sector." When asked if she thought Yushchenko was blackmailed to go with Yanukovych, she replied, "I do not exclude this. Don't think that the political world is so rosy.."
She complained that her deputies were continually offered huge bribes of millions of dollars to switch to the anti-crisis coalition, and mentioned the alleged bribing of Socialist leader Oleksandr Moroz. She claims her bloc presented Yushchenko with evidence of currency transfer, exchange, and withdrawal of cash through Donetsk bank branches to corroborate accusations made by one of her deputies, Oleh Lyashko, that Moroz had been bribed. Immediately after Yanukovych was voted in as PM on Friday in the VR, events took place, that were in the words of 'Lvivska Hazeta' reminiscent of the 1917 Bolshevik revolution, when the order was: "Seize the banks, telegraph offices, and bridges!" An attempt to vote in and appoint new faces, mostly from PoR's top echelons, to the National Bank of Ukraine's supervisory council was indecently rushed through, even before the Cabinet of Ministers were ratified. Similar propositions on the appointment of new people to the supervisory council of State Savings Bank of Ukraine, and Ukr-Ex-Im-Bank, were similarly forced to a vote. Luckily all the proposals failed to achieve the necessary number of votes, and fell through. Lvivska Hazeta correctly adds that the composition of the new 'coalition of national unity' will not be announced until September, when the VR reconvenes. Wasting no time getting even..
Yuri Boiko [see photo] has been appointed Minister of Fuel and Energy in the new Yanukovych cabinet. 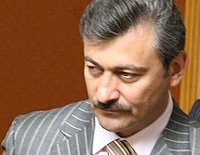 He was chairman of the State Gas Company 'Naftohaz Ukrainy' from February 2002 until just after the Orange Revolution, and was actively involved in the establishment of shady intermediary gas trading companies, including the infamous RosUkrEnergo. "Hair-raising details of Naftohaz's accounting practices..suggest that the company, run by Ihor Bakai and his successors, including Yuri Boiko, was a financial black hole run more for the interests of the elite that the state and its customers." The report provides many details of Boiko's astonishing performance as 'Naftohaz' chairman. When the new Ukrainian government of Viktor Yushchenko came to power in January 2005, one of the first acts of newly-appointed Prime Minister Yuliya Tymoshenko was to call for a criminal investigation into RosUkrEnergo, which she labelled a "criminal enterprise." Shortly afterwards, Oleksandr Turchinov, the head of the Ukrainian security service, the SBU, announced that a criminal case had been launched against RosUkrEnergo. 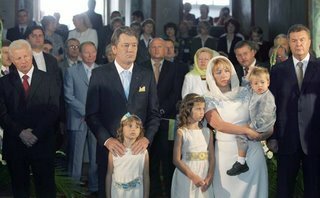 The investigation abruptly ended in mid-August 2005 when the toes of persons close to President Yushchenko were being trodden on. Days later Tymoshenko was sacked from her post of PM. Today, just a day after the new Yanukovych cabinet was formed, Yuliya Tymoshenko, in a radio broadcast, revealed that criminal cases are being opened against Turchynov and Kozhemyakin, both of whom are now BYuT VR deputies. I wrote yesterday about reports that possible exposure of alleged links between the Yushchenko family and Naftohaz may have been used to 'help him make up his mind' and go with Yanuk for PM. What clinched it for Yanuk? On 2nd August, 'make your mind up time' was fast approaching for Yushchenko - whether to approve Yanukovych's nomination for PM, or to dismiss parliament. That morning Yushchenko had met Tymoshenko and it seemed the President was set to choose the latter option. Around 5pm, Yushchenko meets Yanukovych, and they are joined later by Moroz. Some reports say that a pre-recorded video tape, announcing the VR's dismissal, was handed over to TV companies at around 7 pm for broadcasting later that evening. "And we considered that a person who travelled such a difficult road, in order to occupy this post [of President] should act according to the post. Unfortunately, this was not to be the case. Already after the decision was taken about the dissolution of parliament, after a cassette was recorded with an address to the nation, [further] negotiations took place between Yushchenko, Yanukovych, and Moroz, behind closed doors. I do not know what arguments they presented to him. Maybe they reminded him about RosUkrEnergo, maybe others..."
The dim cow of an interviewer did not pick up on this last remark immediately, as any half decent journalist would, but continued with scripted questions..
Another commentator in Ukr Pravda notes that at the same time that discussions were taking place between the President and the Anti-Crisis Coalition, the coalition set up a parliamentary investigative commission to look into the activities of the State oil and gas company, 'Naftogaz Ukrainy'. The commentator suggests that this may have been the prime reason Yushchenko did not dismiss parliament, and that the kompromat material which may have been revealed had fresh elections taken place, is exclusively in the hands of Moroz. "The already-created commission - [well] this is just a means to simultaneously take-over control of shadow schemes, involving the State company, from Yushchenko's people," she adds. It is becoming apparent the President was in two minds until the last minute as to what to do, but it was during final meeting with Yanukovych and Moroz that he finally decided to go with 'Yanuk for PM'..
That's it. That's the end of it, Yuschenko's presidency I mean. He still has some time left but he will be more and more irrelevant to the end of his term. He may have some constitutional powers left and can have some influence that way according to some. But the answers are not found in the constitution, such as it is. (And they have never been found there.) What happens now will be the result of personality, suspension of conscience, discipline, power and money. In other words, the same old thing. And Yuschenko isn't very effective in that kind of arena. He won't even enter the lists. Our Ukraine wants to get in while the pickings are good. How different they've showed themselves to be from what they said on the Maidan? Isn't that contemptible? And what about Moroz? Can anybody still look at the guy when he speaks and take him seriously at all? Or can they still even look at him? He had better hope the new government lasts because he hasn't a prayer otherwise. When they announced the Socialist party had signed the universal whatever-it-was, my first reaction was, What Socialist party? There isn't one. Moroz has decimated it in the scramble to satisfy himself. By the way, anyone find it interesting that there is a need for these agreements? To get anything done politically there's a need to sign an agreement. Why is that? Discuss. So is the Orange Revolution dead? It's a funny thing that now people are down to saying that it isn't dead because there's freedom of the press and freedom of business. (Some others would add free elections to that.) Those are important but they're pretty meager fare. The problem is that none of these--not a one of them-- is institutionalized so not one of them is permanent. 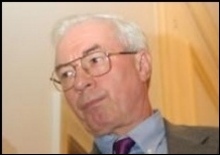 The elections were courtesy of Victor Yuschenko. He didn't use administrative resources as have others. But he didn't use them not because they were denied him but because he wasn't going to use them. The reason was personal to him. But they're still there to be used by anyone who won't scruple to do it. Guess what? Freedom of the press? How about threatening to cancel the license? That would be a frontal assault and it's happened before. And if it happened, there would be hunger strikes by reporters and outrage from liberals. But would anybody take to the streets? No. And the liberals can be targeted other ways to try and shut them up. But that's the frontal assault. How about more subtlety? Just investigate them for tax deficiencies. It's worked real well for Putin. Having to defend themselves in audits and in the courts with the threat of dissolution hanging over their heads can have a wonderful affect on the mind. "Maybe we have been a little too hard on the government." The result? Temniki. "So what is the government's position on this? We do have a responsibility to be unbiased after all." That leaves freedom of business. It's true there is business here and it's getting robuster (is that a word?) And there's more competition than there's been in the past. But, and I will put it this way, power for the clans has come from control, control of business and of government, both of which generate money. To let the market work is to share power. More competition means less control, less power and less money. You tell me which is more likely? I guess it is possible things have changed and, since monkeys can come up with the works of Shakespeare, that makes it a possiblity too. (Statistics anyone? It would take a million million monkeys, a million million years to come up with the word "Shakespeare.") That would mean though that Yanukovych and Akhmetov have changed. Some believe that this is a way for Akhmetov to have more credibility in the West and that he will bow down to Western gods as a result. I have had my say on this already. But let me add that we in the West thought that freeing markets and shock therapy would discipline the market, the players and the government in both Ukraine and Russia. Democracy would be the offspring. The mechanism would be self-interest--a universal law of nature, it looks like. Yanukovych may want better relations with Russia but he isn't going to favor Russian business interests. (See the above.) Putin doesn't care about that, though. Business interests in Russia are subordinated to geo-political interests, which are defined as whatever the Kremlin determines them to be. Now he's got someone he can work with--and possibly manipulate--in Ukraine. That's all that matters. I haven't kept my word that I would not be commenting on the government. The reason for that is that with some of the things happening it's tough to keep one's mouth shut. The other reason is that Yuschenko has been in power. But the second of those reasons has now changed so we will be keeping our word from now on. At least, that is, until we just can't keep our mouth shut anymore. "It was most important that in 2004 people went out into the maidans and squares. We, together with you, were not only witnesses, but also participants of events. What where people talking of? They spoke of fairness, people spoke of a better life, about freedom... This is what we in our lives dreamt of, and dream of. We want to build a fair country, we want to build an independent, democratic country. And what happened after 2004? First, a process of cleansing took place. [!? ]And on this path, it doesn't happen that from the first step everything can be decided immediately. This is a difficult path but this is the path of our state and of our society . Our joint responsibility as politicians, is ensure that people live peacefully in our country, respect one another, and then we will be respected in the world." So the OR was nothing do with cheating the Presidential elections, systematic denial, to NU and their supporters, of access to mass media, intimidation, etc. etc.? Yanukovych and PoR certainly were, "not only witnesses, but also participants of events." "I have noticed, that political betrayal is transforming itself into an infectious disease in Ukrainian political life, and we have not yet ascertained by what means it is being transmitted. One thing I'll say though, is that this disease is not spreading amongst women. Betrayal will not affect our political force. We will not work in shadowy corridors...All that was done on the Maidans has not passed into history...In Ukraine there is [still] a political force that will take on all the responsibility for adhering to all those principles which resonated at the time of the presidential elections. Our actions will not allow anyone to perform deeds not compatible with democracy." Meanwhile NSNU have announced that it is their intention to enter the new Coalition of National Unity, with PoR, Socialists, and Communists, and that its deputies will have a free vote on whether to approve Yanukovych PM in the VR tomorrow. We'll see how many make the switch to the 'new, improved' Yanukovych. So Yushchenko has approved Yanukovych for PM. The ink is not yet dry on the 'Universal' and already Communist leader, and Anti-Crisis Coalition member Petro Symonenko is squealing because NSNU want to sign up too and reform the ACC into a coalition of 'national unity'. Symonenko claims that Parliament will vote on Yanukovych's candidature on Friday, presumably to give NSNU and PoR time to do some back-room dealing on Cabinet portfolios..
Hi-ho silver-o, deliver me from nowhere.. Some photos of 'mordati': Yanuk preparing to make an important statement; & Vasyl Chushko, leader of the Socialists in the VR.